• People who spend more time outdoors in a forest-like environment have, on average, lower concentrations of cortisol, a stress hormone, than those who spend more time in an urban environment. Take advantage of this hour outside, reconnect with nature, and de-stress. • Being outside helps people clear their minds and offer a new perspective after months of winter. With a clear and balanced mind, you can make better decisions. 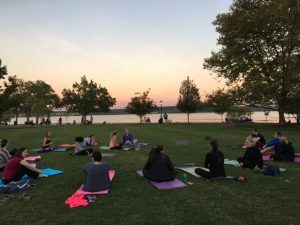 • While it may feel awkward at first (you’ll have to accept the bugs, unregulated temperature, and grass) in time, practicing yoga outside will work your muscles as well as quiet mind chatter. Your mind will be focused on all that is going on around you; nature will help you to be present. Looking at beautiful scenery and hearing the joyful sounds of people and animals can release endorphins. No more lingering thoughts or worries, just beautiful sunsets, picturesque scenery, and acceptance. • Connecting with the actual, physical Earth will make you feel more grounded. • We often have the advantage of doing our balancing postures on smooth, even surfaces. But that’s not life! Life is bumping and changes constantly. Try doing Half Moon on the grass and notice how you have to work differently in your body. Then try doing it inside. It might not seem so hard now! • Being outside sends messages to the brain that we are in our natural environment. The body responds by staying alert and focused and thus more ready to take on those balances and challenges of life on and off the mat. • Many Americans lack Vitamin D because they lack exposure to the sun which is a great natural source. By exposing yourself to the sun you will increase Vitamin D levels which will in turn strengthen bones, boost you immune system, and fight depression along with many other benefits. You should still wear sunscreen! And also consider wearing a hat. • Doesn’t it just make sense to do Sun Salutations to the actual sun? Greet the source of all life in a more authentic way. I am. I could run and maybe stretch outside, but it’s not the same as someone leading me through a class. On select Sundays this Spring AND Summer Refresh yoga teachers will bring their practice outside and lead a FREE sunset class for the local community. Just check the online schedule to find out the dates. No yoga experience is necessary and drop-ins are welcome. 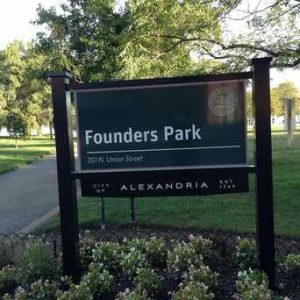 The classes meet at Founder’s Park on Union Street near the waterfront. 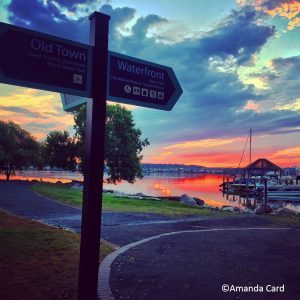 Practitioners are able to simultaneously watch the sunset over the Potomac River, listen to nature’s soundtrack, and practice yoga! It is truly the cherry (blossom) on top of any weekend!